I thought this post would be easy. After all, I'd just written a boyfriend into the Heirs of Watson Island series, and I don't even want to think about how many hours I've spent with him. I'd also just finished going through the results of the Book Boyfriend Contest, in which I asked people to list the qualities they consider important in a book boyfriend. Which was all sorts of eye-opening fun, so I'm including the results again below. Interesting and kind of scary, right? Almost as scary as realizing that just like pretty much everything else I've ever thought was going to be "easy," writing about how to write a book boyfriend is hard. Because when I really sat down and thought about the process, I had No. Clue. It wasn't as if I'd sat down before hand and done a catalog of qualities that would make him "boyfriendish." Not in general. I made him specific to my main character, Barrie. I made him a person--the right person for her. At the most basic level, a book boyfriend is character. One who is pivotal to the story, which means he has to be equally compelling to the main character. But since we aren't always going to be in his head, we get to play all kinds of games about how to get his motives across. Which is just about my favorite thing to do. I actually do a lot of worksheets when developing characters. I think about their backgrounds and by the time I'm done, I pretty much know what makes them tick in terms of appearance, personality, strengths and weaknesses, goals and wants. And then when I sit down to write, everything kind of shifts. The characters become their own people. I can tell them what to do, and sometimes, they turn around a flip me off. Eight was a bit like that. He turned out kinder than I expected, and more disillusioned with his family and Watson Island than I expected. He was a little bit more patient with Barrie than I expected--okay, a lot more patient with her. Their relationship is a bit like those old movies that I love, where there's a bit of animosity because there are reasons why the two can't trust each other, but neither can deny the attraction. Is smart but dyslexic, so at least that keeps him humble. Okay, not THAT humble. Or could it be because Eight knows exactly what Barrie wants and is compelled to give it to her so that she can't help but fall in love with him? Whether she wants to or not. That's the second key to building a book boyfriend, I think. As compelling as you make the reason for the main character and the guy to want to be together, you have to give them an equally compelling reason why it isn't going to work. Plus there's an overall book boyfriends giveaway for the blog tour! 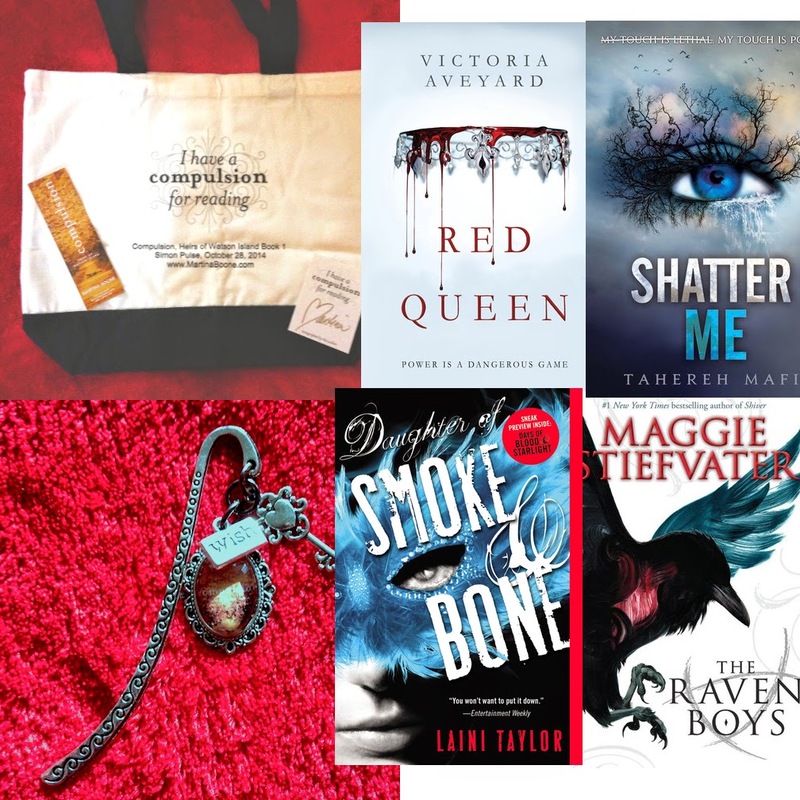 Want more book boyfriends and more amazing prizes? Catch the full 14 Days of Fictional Swooning Schedule! Share with us. What's YOUR favorite kind of book boyfriend? Leave a comment below! Thank you so much for the post and the AMAZING giveaway! Thanks for the giveaway! The information in this post might come in handy when I'm writing for my book boyfriend. I've been having some trouble with that. Love the giveaways on this blog! I love a guy who has a good sense of humor, and is just easy to be around. Lovely post! I've always wanted to know how authors created such amaaazing guys, like Eight. :) I always like when book boyfriends are confident to the point of cockiness, but also funny and attentive. But I also hate when they are just too perfect; they have to have flaws, or else they just aren't believable. Thanks for the giveaway!! The very basics category gave me a good laugh! Those are definitely important factors in choosing a boyfriend in the real world. I'm a little more tolerant about book boyfriends though. They can be bad boys! thanks for the awesome post and giveaway!! It's a ton of fun! Thanks for stopping by, Kristen! Love this, =) thanks for the giveaway & Happy Wednesday! Great post! Thanks for sharing the interesting results of your Book Boyfriend Contest. Sweetness is attractive -- just in a different form, right? A sense of humor is extremely important to me. IRL and in my book boyfriends lol Thanks for the giveaway! Thanks for the awesome giveaway! I wouldn't have put attractiveness at the top but I do think a sense of humor and compassion is important! Me too -- attractiveness fades anyway (or at least gets covered by a belly and an extra chin 9/10ths of the time later in life) so we are going to need that sense of humor and compassion! That's fine -- they're all bonus points. Nothing is required except your mailing address! I'm so thrilled for you, Martina. I asked for COMPULSION at my local Target and their going to see about getting it in. :-) I feel so blessed, having "known" you for several years through Twitter and your blog. And remember my First Five Pages entry ages ago? You're one of the people I look to for inspiration and confirmation that yes, this writing dream can come true and here's the proof. I love love love the Persuasion cover can't gush enough about that. This list is also soot on. Now I know for the future if I want to build my book bf I have the recipe! Thanks, Britt! : ) Only sort of a recipe though, right? I just had so much un judging fanfic for Jennifer Armentrout's contest, and I can see the appeal of taking a guy you love and writing about him. I LOVE the Persuasion cover! I can't wait to dive into this series! I enjoyed reading the traits. Sane is always the way to go. Love this. Yes, I vote for sane! I haven't read compulsion since, I can't find the book here. >.< But whenever I get the chance to grab it I will. It really intrigues me, I wanted to read it so bad. Thank you so much for participating in the blog hop!! I love your "how to build a book boyfriend" and the results of your what's important in a book boyfriend were great to see!! Thank you so much! Me and my sister have been dying to read Red Queen and Shatter Me! I enjoyed Compulsion and look forward to reading more of your books. Keep up that mystical talent of yours. These giveaways are always great. Thanks! What a great giveaway - good luck to everyone!